What is multibagger stock? How to identify best multibagger stocks for the investment? Which are potential multibagger stocks for FY 18? Before getting an answer of these questions let us go through one real life example – My friend had purchased 1000 shares of Tata Mataliks by just making an investment of 1 Lakh in April, 2016. In just one year time frame this stock had turned out to be multibagger stock. His capital investment has grown by 5 times in one year. From this example, it is clear that multibagger stock is stock that can give multi fold return to the investor. A potential multi bagger stock can make you wealthy in short period of time. So, let’s try to get more information about such stocks. 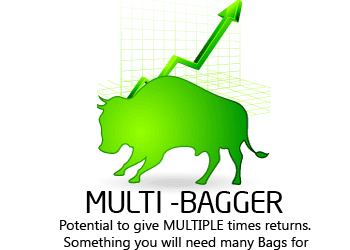 A stock that gives several times returns on the cost is called multibagger stock. A stock that doubles its price is called two-bagger stock. If stock grows 10 times it is known as 10 bagger stock. If it grows by 100 times it is 100 bagger stock. Multi-Bagger stocks are undervalued stock with strong fundamentals, future business potential, and strong corporate governance. There are several stocks in India which have given multifold returns to the investors. Caplin Point Laboratories is an example of multibagger stock. Caplin Point Laboratories has grown 10 times in short period of time. Other stocks in this category are Uniply Industries, Page Industries, Ajanta Pharma, Tata Metaliks etc. How to Identify Multibagger Stock? Hunting for a potential multibagger stock is a difficult task. You can follow steps given below to identify potential multibagger stock. The debt level of a company should be low. A company should be nearly debt free. A revenue of company should be growing quarter to quarter. A performance history of a company should be good. The company should have good source of earning with scalability in operation. The company business model should be sustainable and should have favorable future business potential. A management of the company should be strong and clean and decisive. The financial year 2016-17 was a year of multi bagger stocks. There were many stocks that turned out to be multi bagger stocks last year. Few mulltibagger stocks of 2017 are Tata Metaliks, Thirumalia chemical, Shilpi cable etc. 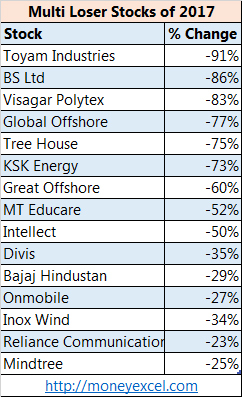 Apart from multi bagger stocks there were few stocks that turn out to be multi loser stocks in last financial year. Few Multi loser wealth destroyer stocks of 2017 are Toyam Industries, BS Ltd, Visagar Polytex etc. 15 Multi loser stocks of 2017 are given below. It is anticipated that FY 2018 will be another good year for the stock market investors. Few potential multi bagger blue chip stocks for the investment as per Motilal Oswal are Tata Motors, ICICI Bank, SBI, ITC, Britannia, Hindalco, Colgate Palmolive India, Crompton Consumer, IOC Ltd, RBL Bank, Manpasand Beverages, Ultratech Cements, Force Motors, Maruti and JK Cement. What is your call on above Stock Pick? Do you think that these shares will outperform in future? I am Mahesh V from India, Goa. I had suggested to my friends – this stock Neuland Lab. ( at 810 levels on 05/12/16), and as on date, its around. 1500.(03/04/2016). Do i ask them to book profits, or they should still hold it. I suggest to book the profit for half of the stock. Hi Ravi, You have mentioned only the past multi bagger performance of few stocks but can you tell the multi baggers for FY2018. Also you have quoted the stocks from Motilal Oswal but we are looking for your multi bagger stocks. Out of these 3 Stocks Force Motors, Maruti and Indusind Bank turn out to be multibagger. Stay tune for future multibaggers. According to me, one share LOYAL TEXTILE MILLS LTD. will prove to be a multibagger for the next two years. One can safely invest in this share.